Automotive applications (cars, trucks, buses, trains, ships and aerospace) represent the largest single end-use area for technical textiles. Mobiltech products can be broadly classified into two categories: visible components and concealed components. 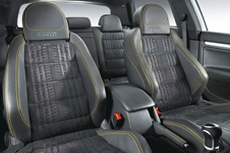 Visible components include seat upholstery, carpets, seat belts, headliners, etc. Concealed components include Noise Vibration and Harness (NVH) components, tyre cords, liners, composite reinforcements for automotive bodies, civil and military aircraft bodies, wings and engine components, etc. The mobiltech segment’s growth depends largely on the growth of the automotive sector in India, which has been brisk in recent years. India’s mobiltech segment is hence expected to grow at a rate of 17% to US$ 1,870 Million by 2016-17 as per estimates of the Working Group on Textiles and Jute Industry, Ministry of Textiles, Government of India.